The largest piece of contiguous, undeveloped land in the Lower Peninsula is Wilderness State Park, a 10,500-acre tract that includes a rugged interior ranging from mature hardwood forests and vast wetlands to a high point called Mt. Nebo. Winding across this vast park is a 38-mile network of trails with 11.4 miles designated as part of the North Country Trail, the national trail that winds from North Dakota to New York. Despite all the acreage and miles of trail, Wilderness didn’t become a haven for backpackers until 2008. That’s when the staff unveiled a pair of walk-in campsites located in two of the most remote corners of the park. One of them is perched at the end of a point on the north shore of O’Neal Lake, a scenic campsite seemingly miles from anywhere that is well worth shouldering a backpack into. During the day here, there’s an abundance of waterfowl resting and feeding near the shoreline. In the evening you can cast for bluegills and bass. 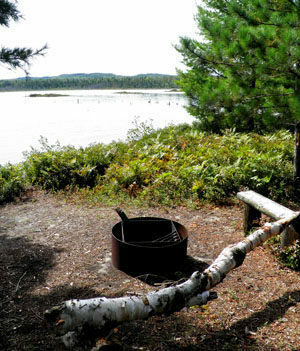 At night you can sit at the fire ring and watch the moon shimmer off the smooth surface of the lake. The most natural loop and a perfect weekend outing for backpackers is the 13-mile trek described below that begins and ends at the Nebo Trailhead along Wilderness Park Drive. 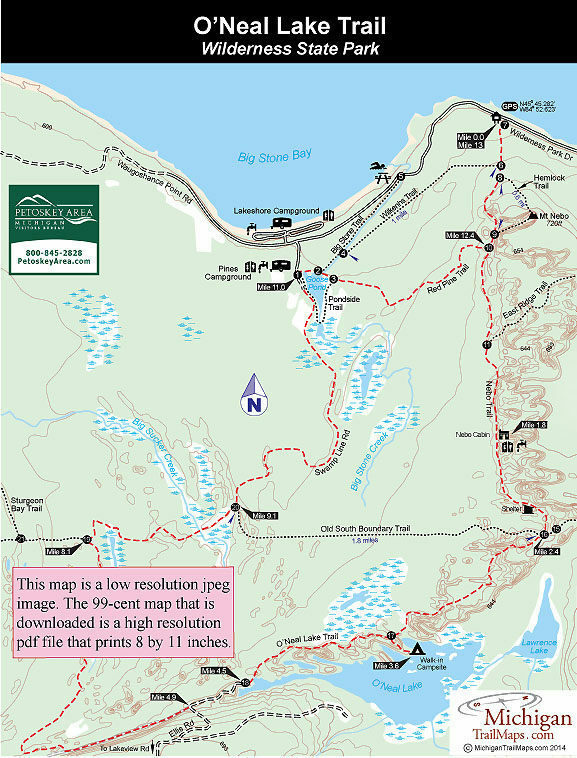 The first day would be a 3.6-mile walk to the campsite, with the second day a 9.6-mile trek back to trailhead. There are other ways to shorten the trek, including renting the classic Nebo Cabin for a round trip of only 4 miles from the trailhead, but overall you’ll find the terrain level, the hiking easy and the second day not excessively long. A water filter is necessary for this trip as there is no source of safe drinking water at the walk-in campsites. Inspect repellent is also needed for any outing that occurs from late May through August. The numerous wetlands and small ponds are literally bug factories during the summer. October is by far the best month to hike this route. The trailhead for the Nebo Trail is well posted along Wilderness Park Drive and in the parking area is a gate across the trail and post No. 7 with a display map. This overnight trek begins by following the Nebo Trail south to post No. 16, reached at Mile 2.4. For a full description see Nebo Trail-Swamp Line Loop. Nebo Trail ends at a junction where posts No. 15 and No. 16 are located adjacent to each other. Post No. 16 marks the beginning of the O’Neal Lake Trail which is more of a foot path than a two-track and begins in a rolling terrain. Within a mile you spot O’Neal Lake through the trees. At Mile 3.6 is the posted spur to the walk-in campsite. It’s a 200-yard walk to this delightful spot at the end of the point. From the middle of the site are views of both the main body of O’Neal Lake and the quiet back bay that is dotted with lily pads and frequented by waterfowl. The simple amenities include a fire ring with two crude benches, a backcountry toilet and a bear pole to hang your food. There is no source of drinking water so boil or filter what you consume from the lake. From the campsite spur O’Neal Lake Trail continues west skirting a vast wetland to the north and low ridges to the south. It is marked by orange blazes indicating its use as a snowmobile route in the winter. Most of the trail is dry but there can be wet areas in the spring and early summer. You can’t see the lake until Mile 4.5 when you pop out at an open sandy area and can spot post No. 18 on the far site. The post marks the dam that created O’Neal Lake, a reservoir that was created for the benefit of waterfowl. A foot bridge leads across the small dam to a parking area, an unimproved launch site for hand-carried boats and a forest road that heads west. Follow the forest road and in 0.3 miles it will swings sharply to the south and becomes Ellis Road. At this curve O’Neal Lake Trail, still marked as a snowmobile route, continues west along an old two-track. Within a half mile the trail veers north (right) off the two-track at a junction posted with a snowmobile sign. O’Neal Lake Trail ends at post No. 19, a major T-junction reached at Mile 8.1 with a gate. 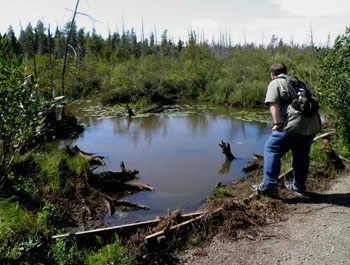 The loop continues by heading east on Sturgeon Bay Trail, passing some interesting wetlands. In less than a mile it crosses Big Sucker Creek on a cement bridge. Take time to study the creek - often brook trout are darting back and forth. Post No. 20 is reached at Mile 9.1 and marks where Old South Boundary Trail heads east and Swamp Line Road heads north back toward civilization, i.e. the heated restrooms and water faucets of the park’s Pines Campground. Within 2 miles you pass a sign designating the area you just passed through as Big Stone Creek Wilderness and then just before the campground entrance, is post No. 1, a major trailhead in the park. From this point there are several ways to return to the Nebo Trailhead including following Big Stone Creek, the park road and Wilkenhs Trail. The most scenic route, however, is Red Pine Trail picked up at post No. 3 after skirting the north end of Goose Pond. Red Pine is an interpretive trail that treads the crest of a forested dune and passes some stumps that are remnants of logging operations from the late 1800s. Within 1.2 miles the trail brings you back to Nebo Trail, just a half mile south of where you left your vehicle.